Valli nudged me into picking this up when I told her about my fears of making anything from her list of traditional recipes. For once cooking did seem like rocket science. Now, if you have been around for a while you make think it would have been a cake walk for someone who has baked 4 kg themed cake in 16 hours, or made anarse . 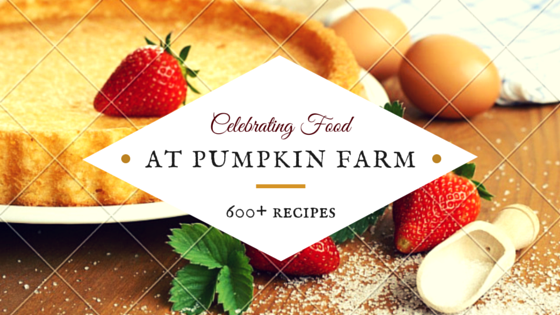 When I went through the list, for some strange reason I realized that when it came to traditional recipes, I often bank on Mother or Mother In law who happen to be around during the festive periods. This time in the middle of nothing, I was all by myself to try something like a rose cookie or gujia. I started with something out of my zone....Ras malai. 1) Divide the milk in half, boil them in separate pots. 3) Strain the cottage cheese out of the whey and let it stand in the strainer for 15-20 min. Try to squeeze out as much liquid as you can. 4) Mash the cottage cheese using a food processor (for best results) or with your hands to form a smooth dough. 5) Pinch out small balls of this dough and shape them as you like, slightly roundish but flat. 6) In a deep sauce pan, add the remaining sugar with about 2 cups of water and let it come to a boil. 7) Reduce the flame and drop the cottage cheese balls in it. 9) The other pan, add the saffron strands ,keep stirring the milk until you get a creamy texture and the quantity is reduce to less than half. 10) This should be done in about 20 min for both the pans. 11) When the rasgullas are done, take them out and squeeze or let it strain through. 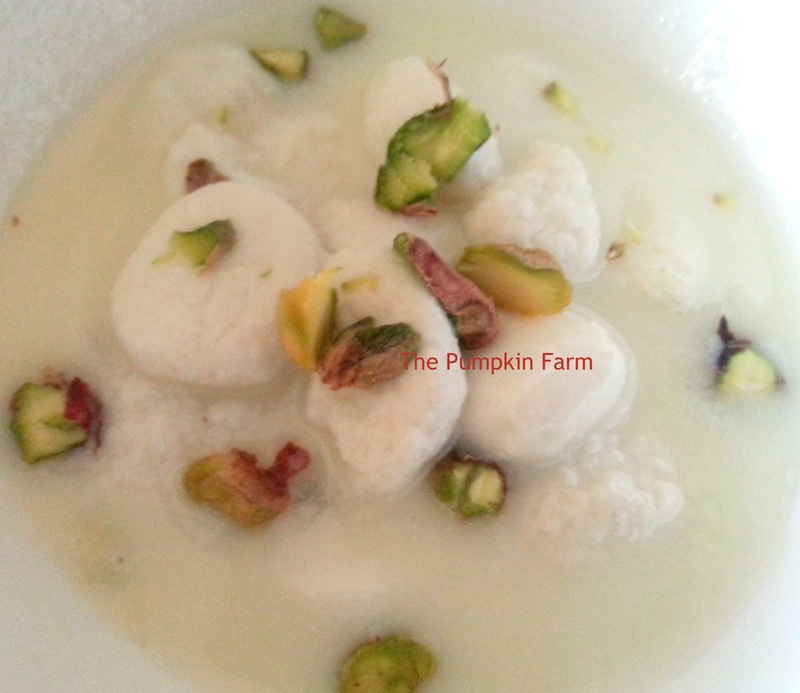 12) Add them to a bowl, pour the cooled malai mixture on top and garnish with chopped nuts. Aren't these wonderful and wonderfully easy to make? I tried rasgulla this Diwali but missed out the rasmalai. These small ones you've made look extremely cute! 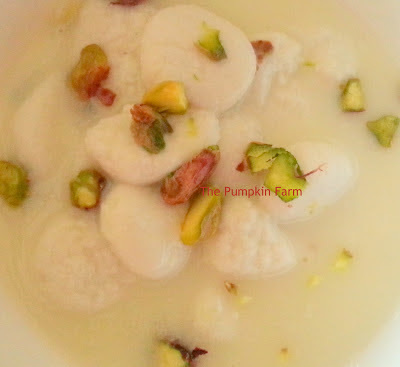 You guys are pulling me to make some rasmalai, am keeping myself from sweets especially milk based sweets. Cant resist. Looks delicious. Love rasmalai never tried making it though. Wow.. My all time fav.. :) :) Delicious.. wow..wow..Pradnya..This has been on my list, but...but...no!!! I am so hesitant, I think I ought to build up courage and try..they look too good! If I can pick the traditional foods category, you certainly can!!! Can't wait to see what others you chose! My all time favorite dessert. Looks mouthwatering delicious. So wonderful that you got yourself do these dishes...I know how rewarding it feels..Rasmalai looks so good P!